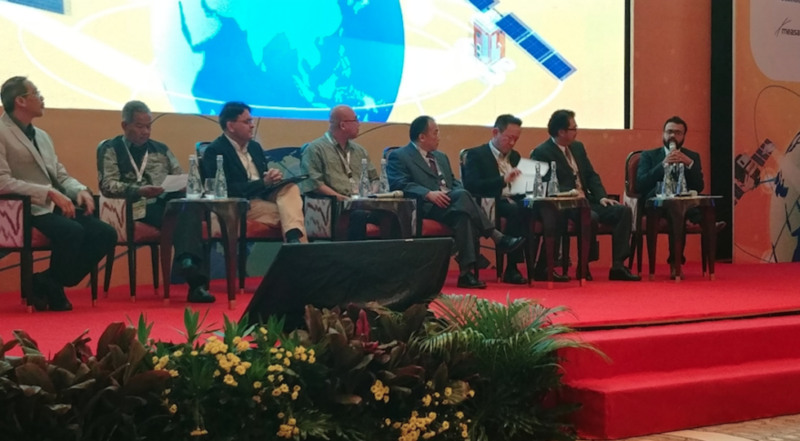 JAKARTA, Indonesia — As new high-tech satellite antennas start hitting the market, several satellite operators expressed concern that existing and future antennas won’t meet their needs. Fleet operators agreed that satellite antennas are often the weak point in the business case for satellite broadband, lagging behind other technologies and costing more than customers want to spend. Many said they hope flat panel antennas, which can track multiple satellites simultaneously and fit on more surfaces than traditional dish antennas, will succeed, but aren’t hanging hopes on their success. “One essential piece of the puzzle, which is the antennas, have not innovated,” Imran Malik, SES Networks vice president for the Asia Pacific, said July 3 at the APSAT 2018 conference here. The lack of antenna development is keeping antennas expensive and making volume production difficult, he said. Huang Baozhong, executive vice president of APT Satellite, concurred. His company sees “great potential” bringing satellite connectivity to fishing vessels at sea, should antennas become more affordable. Last year Kymeta, the front-runner in flat panel antennas, started shipping its first units. Phasor anticipates starting production of flat panel antennas late this year or in the first half of next year, CEO David Helfgott told SpaceNews by email July 6. And several other companies intend to follow in 2019. Malik said he is confident that flat panel antennas will help take satellite communications from niche applications to a mainstream means of connectivity. Others didn’t share his view, however. Loke said Eutelsat is able to provide 70-centimeter antennas systems, including the modem and other components, for around $350. China Satcom Vice President Yao Fahai expressed concern that flat panel antennas, if they have performance issues, will create burdensome interference issues. Malik said insufficient antennas are “one of the most critical factors,” preventing satellite communications from playing a greater role in cellular networks and from being used in urban settings. “Maybe this will happen in the future, but at the moment what’s preventing this from happening is the antenna,” he said. O3b mPower is a seven-satellite system Boeing is building for a 2021 launch, and is designed to offer 10 terabits of capacity.